Ansys is the dominant player in the simulation software industry, helping the world’s most innovative companies such as Ferrari, Dyson and Tesla design and test new products. In order to minimise risk, the Fairlight investment process avoids technology businesses that are dependent on one product that has a binary success/failure payoff distribution, instead looking for products that are already commercially successful with durable revenues. Ansys is an excellent example of a business that demonstrates the quality traits Fairlight is looking for whilst balancing profitability today with investing for growth tomorrow. Dyson: Ansys software was used to design the revolutionary bladeless Air Multiplier Fan, rapidly iterating virtually instead of building time consuming and costly physical prototypes. Ferrari: Le Mans race cars are designed using Ansys software, replacing wind tunnel testing which takes several weeks with virtual simulation that allows for several alternatives to be evaluated in a single day. Emirates Team New Zealand: The 2017 America’s Cup yacht race winner uses a 100% simulation driven development process to test thousands of designs for settling on an optimised final design. As the largest player in the industry Ansys is able to outspend rivals in R&D, extending its competitive advantage as it improves the accuracy and speed of its products. Importantly, in the simulation industry price is generally not a key purchasing criterion for enterprises given the software usually comprises a very small part of the total development cost whilst providing irreplaceable functionality. Ansys has an impressive track record of profitable growth - growing sales at 11% p.a for the past 10 years with EPS compounding at 14% p.a. Importantly, Ansys’ subscription-based business model (clients generally pay annual subscription fees upfront) results in >100% cash conversion. 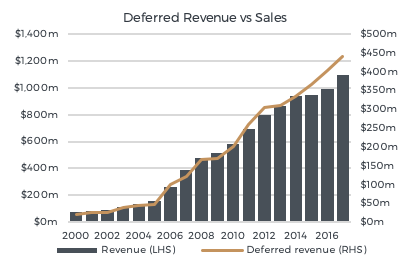 As the business grows, its deferred revenue cash balance continues to grow giving shareholders additional capital that can be used on tuck-in acquisitions or stock repurchases. 1. By minimising physical prototypes clients can reduce costs and speed up time to market for new products. 2. For many customers the cost of product failure is extremely high (aerospace, automotive, construction), simulation dramatically reduces many of the associated risks. 3. Use of simulation leads to greater innovation and improved product quality ultimately leading to increased demand and sales. These symbiotic relationships result in strong customer loyalty, with >95% renewal rates on maintenance contracts and ~90% renewal rates on leases. Digital twins: Traditionally simulation has primarily been used in the design process, however as devices become increasingly interconnected ‘operational simulation’ is enabled. This involves creating a simulated version of a real device (such as a jet engine) that is in the field, and then feeding data from sensors into the digital twin to accurately predict when the device might fail, needs maintenance or how performance can be optimised. Autonomous driving: The haste to develop fully autonomous vehicles has led to demand for a simulation product that can cut down testing time and increase accuracy. Ansys has a comprehensive solution for validating the safety and reliability of autonomous vehicles with simulation, a task that would otherwise require billions of miles of on road testing. New products: In 2018 Ansys released ‘Discovery Live’, a complete rebuild of the core architecture making the product faster and easier to use. This product is aimed at increasing use of simulation amongst design engineers, a cohort which outnumbers Ansys’ traditional customer base of simulation experts by a factor of 10. When evaluating high quality growth investments, Fairlight seeks businesses with sustainable competitive advantages that can underpin a long runway of high returns on capital and excess earnings growth into the future. Ansys’ dominant market position, customer relationships, superior technology and financial characteristics give us confidence it can continue to compound value for shareholders over the long term. You're right I've never heard of this company. It's always refreshing to learn about new businesses and how they make a profit. Thanks for the insight Will. Regards Mark. Is this an unlisted Australian company? I cannot find this Company on the ASX, can you advise where it is listed? Hi Jon, Ansys is US based and listed on the NASDAQ (NASDAQ:ANSS). Regards, Will.